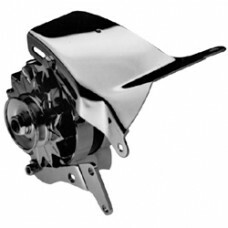 Proform chrome heavy duty pressed steel alternator bracket. These brackets are a great way to add instant visual impact to your engine. They sit high on the engine in front of the cylinder head (on UK drivers side). Some minor adjustments may be required to fit some applications / water pump variations. Fits Small Block Chevrolet with long water pump. Lower alternator bracket bolts to water pump, upper bracket bolts to thermostat housing (ensure that your thermostat housing is at stock height e.g. will not work with EDEL2975, EDEL7501 or EDEL3500). Use universal alternator spacer PRO66179 between rear of alternator and cylinder head – also requires long 3/8” bolt.